This winter-hardy Carnation is a great plant for landscape and container use. Its abundant fragrant flowers are a delight for all growers. Carnations make great hanging baskets due to their unique habit. Plants mound in the head of the basket, but then trail and cascade as the spread out over the side of the pot. Growers should cut back Carnation plants frequently during winter months so that plants are short and stocky for a burst of color in the spring. Feed Carnations with fertilizers at 150-200 ppm N constant liquid feed program. Although the plant can tolerate higher dosages, it will produce stringy growth that is undesirable. Maintain a pH level between 5.5 and 6.0. The ideal way to grow the Carnation plant is to keep in a cool house in the winter with a temperature of 45 F and bring it to the a warmer house in the spring to flower. This is a process called vernalization and allows you to grow a nice compact plant due to cold temps, but which blooms widely when placed in warmer temps in the spring. Pinching is not required, but useful to shape the pot. Allow 4 weeks from the last pinch for blooms to develop. Space Carnations in order to allow for lots of light. This will aid in keeping plants short and stocky. 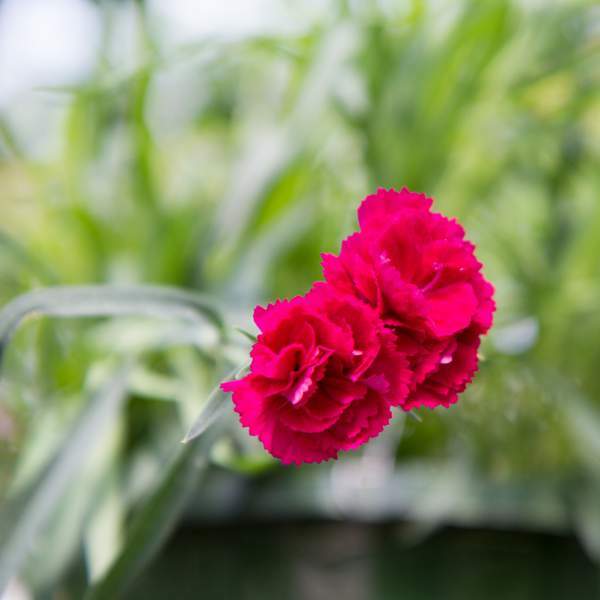 We do not recommend any growth regulators on Carnation. Control growth by growing the plants in a cool, bright area. Carnations are not prone to pests, but watch out for whiteflies and mealybugs. Carnation are not prone to many diseases, but watch for botrytis in the early spring. This grey rot is usually associated with wet or humid conditions. You can prevent botrytis by allowing the plant to dry out between waterings, allowing for good airflow in your greenhouse, and spacing to allow the sun to penetrate to the soil level. The most common chemicals used to treat botrytis are Medallion and Banrot. Use them as a drench according to each label's instructions. We recommend these trailing carnations for baskets only. If you would like a 4" crop, we recommend an upright variety. Plant 5 starter plants per 10" pot, and plant them deep so the top of our ellepot is slightly below the soil level in your container.